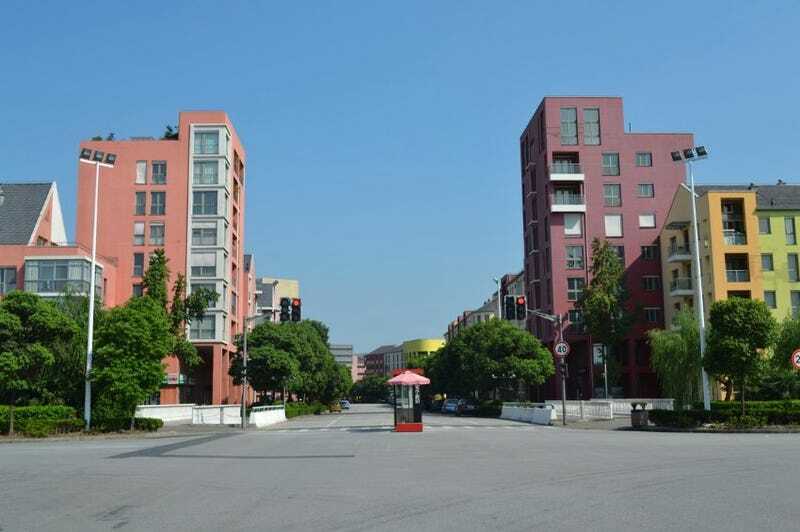 This may look like your average German suburb on a quiet day, but it's actually a planned community 30 kilometers outside of Shanghai. This is Anting German Town, a one-square-kilometer residential development founded in 2001 and built specifically to resemble a little slice of Deutschland. There's only one problem for this quirky Teutonic oasis —nobody wants to live there. Anting was conceived by the architectural firm of Albert Speer & Partner (yes, the son of that Albert Speer). Despite low housing costs, this community's isolation dissuades tenants from moving there. Indeed, this is the same problem that plagues places like Ordos City and the sprawling and empty New South China Mall. In the case of Anting German Town, it is surrounded by industrial parks — a single road links it to nearby city of Anting. This model city is further hobbled by awful infrastructure (for example, the post office is finished but unopened), pollution, unfinished apartment buildings left to rot, and crappy feng shui. The plan was for 50,000 people to live in Anting. "The city was intended to be completed in 2008," says Johannes Dell, Speer's representative in China. But only the first portion has been built. In the evenings, there are hardly any lights on in the apartment blocks. Although the development company insists that most of the apartments have been sold, city planners estimate than only one in five homes is occupied. Apart from the forlorn statues of Goethe and Schiller, there is barely a trace of German culture in Anting. The annual Oktoberfest, which bands from Germany used to travel to, has been cancelled. A German pub and a German bakery also shut down. The manager of the only German restaurant in the area, the "Wirtshaus," lives in the new district, but his restaurant is in the old town. "There's more going on there," he says. Officials estimate that only one in five apartments are occupied in Anting German Town. To make matters even more authentically weird, the community's graffiti was planned to resemble actual German street art and the nearby Volkswagen plant guarantees that plenty of VWs tool through city center. You can see more photos of this curious near-ghost town over at Der Spiegel.